The night air has already turned crisp and the leaves are starting to change colour on some trees in my neighbourhood... sigh. It feels like summer just started and it hasn't even been a very warm one. Hopefully it makes a late come back. A new challenge starts today at Christmas at Sweet Stampin' and our fun theme for you this time around is 'Winter Animals.' I was rustling through my stash trying to decide what papers to use, when I came across some cute DP with a little winter scene on it. After that, this card practically made itself. I usually put in so much more effort with my cards, and it kind of felt like I was cheating, so I compensated by adding tonnes of glitter to all the snowy bits on the image. The glue I used gave a dimensional effect - I think it turned out cute. I hope you will pop on over to Christmas at Sweet Stampin' to see the beautiful cards the talented team has made and then come play with us! It is absolutely wonderful to already have a stack of Christmas cards prepared :) Of course, there is a fab prize up for grabs too - Quixotic Paperie will be providing one lucky winner with a £10 voucher to their online store! Thanks so much for visiting and for taking the time to leave a comment. I really appreciate each one! That's why I like to add so many embellies when my cards are quick - especially those pre-coloured digis. Feels less like cheating when you change it up a bit ;) I think this is adorable! Cute winter scene! Glitter is always the perfect accent for snow! Thanks for joining us at Holly Jolly! Your card is super cute. Love the polar bear and scene. Thanks for joining us this week at CCC. Your winter animals are adorable! Thanks for entering Christmas Card Challenge this week! Fab card Dawn - I really love the images in the middle! 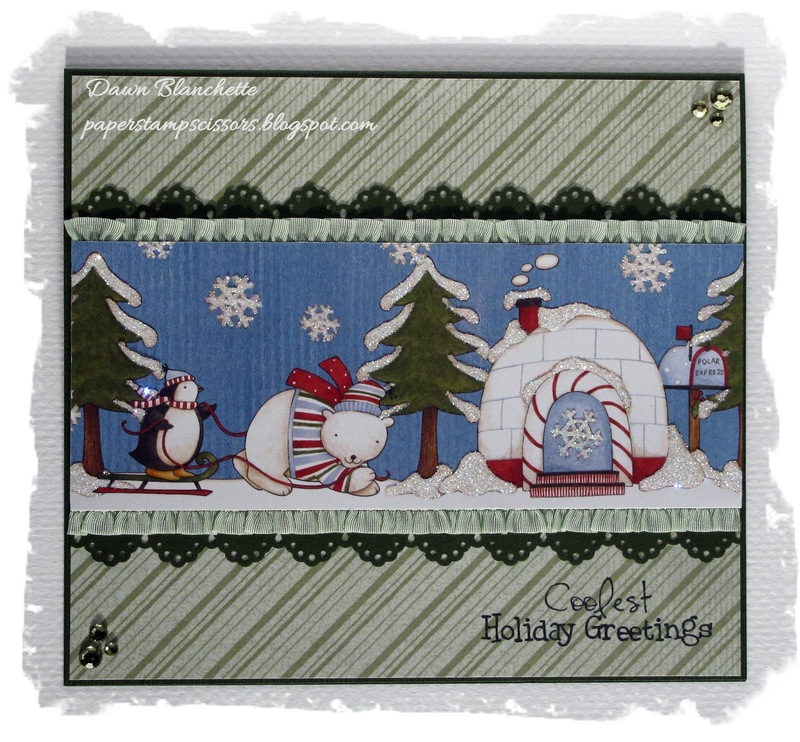 Love that sweet little winter scene ... so very glad you joined us at jingle belles. Very cute card and it's not cheating at all. Great little scene and a fab Christmas card.